Cis folks, we need to have a talk. Especially if you are offended by these words. In the last few days I’ve been a part of and witnessed a number of worrying conversations involving cisgender people who call themselves allies to the trans community, yet don’t listen to a thing we have to say. Instead, they become defensive when corrected, invalidate and minimize our experiences, and tell us how we should feel and act. A cis man on Facebook told me that I — a transgender person — do not know what the word transphobia means. Normally I’d give someone like this the benefit of the doubt. He doesn’t know me, he doesn’t necessarily know I’m trans, and he doesn’t know that I spend a significant amount of my time interacting with other trans people and educating cisgender people about trans issues. But my profile picture clearly states that I am trans (it’s currently set to a Trans Day of Visibility frame), and yet he persisted in trying to explain to me a concept which affects my life on a daily basis. What disturbed me about this exchange was not that we disagreed, or that we had different usages of the word. As I wrote on the post, the terms we use when discussing bigotry are of secondary importance. It doesn’t bother me if people use transphobia to mean only overt bigotry, and as long as we can agree that trans people do in fact face systemic discrimination in our society, we can have a productive conversation about how best to address that. The thing that upset me about this interaction was the way he disregarded the perspective of a person who is directly affected by this issue and instead made the conversation about him and how accepting he was towards his trans friend. Instead of acknowledging my point about word usage and continuing to discuss from there, he felt the need to defend his honor and virtue by proving to me he’s not transphobic — according to his usage of that word — and in fact he has a trans friend who he fully accepts (and he even asked how he could help — give this guy a trophy!!!!). Despite me never accusing him of being openly bigoted, he took my broad usage of the word “transphobia” not as the commentary about social programming it was meant to be, but an attack on his personal character, and rushed to correct me. He seems to believe that because he doesn’t see himself as holding any overt prejudices against trans people, he has nothing left to learn about or from us. His official Ally Card is laminated, waiting and ready in his wallet for the next time it needs to be flashed. I’ve seen multiple instances of this kind of defensiveness over the last week. I saw several cisgender friends of mine say that they feel attacked and othered by being labeled “cis”. When their trans friends told them that it’s not meant as an insult or slur at all, but simply a descriptor, they told these trans people that they are wrong, as if they somehow could know their intentions better than trans people themselves. A transmasculine friend of mine approached their sociology professor after class to correct her when she said that trans guys are “girls who want to be boys.” Instead of thanking them for the information or even simply asking to continue the conversation further until understanding could be reached, the professor told them, “Don’t tell me how to teach my class!” and ended the discussion. 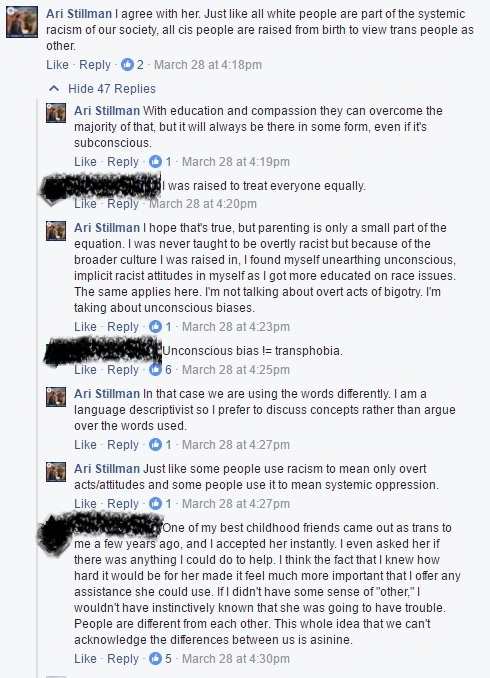 She believes that because she has some minimal education on the topic, she knows as much or more about trans issues than a trans person themself. I don’t know their intentions for sure, but I believe all of these people mean well. I don’t think they’re bad people who actively want to hurt the trans community. I take them at their word that they really do want everyone to be treated equally, and don’t want members of marginalized groups to be discriminated against. I believe the person on Facebook who said that he fully accepts and supports his trans friend. The problem is not his intentions. The problem is that there is something more important to him and the others in these stories than achieving understanding — being seen as virtuous. I understand the impulse to defend yourself against criticism you feel is unwarranted. If you fully support the trans community, I understand that you don’t want people to have the wrong impression of you, and you’re going to push back against accusations that you feel call your allyship into question. But if you aren’t going to listen to the concerns of the group that you claim to be an ally of and allow yourself to be open to constructive critique, you should think long and hard before you use that term to describe yourself again. That’s not to say that you must unflinchingly accept everything an individual tells you just because they’re trans, queer, black or part of any other marginalized group. There are members of marginalized groups who themselves are victims of misinformation, ignorance, bigotry, and internalized bias against their own group. Occasionally a trans person may position themselves as if they speak for the entire community when they’re really only relaying their personal experience or opinion. But if you see multiple members of this group expressing the same concern over time, especially when it’s about something that affects them directly, there’s a good reason for that. That’s why it’s essential to speak with a wide variety of people in a marginalized group and not rely solely on the opinion of your token friend. If your friend happens to disagree with the consensus view of the group, you’ll get an impression which does not represent the group as a whole. For example, there are some trans people who believe that trans people should only use the bathroom of the gender that they were assigned at birth, at least until they have gender confirming surgery or can “pass” in the eyes of cis people. That opinion is not by any means the majority opinion of the trans community, so you will be misinformed if you’re getting all your information about trans life from someone who holds that view. So if a trans person tells you what it’s like to be trans, you don’t have to automatically accept everything they say un-skeptically. But given that they are much more likely to have accurate information about being trans than you are as a cis person, you should at least look further into what they’re saying before you discard it. Ask a variety of other trans people if what they say is true. Use the infinite wisdom of the interwebz. I guarantee you will be able to find that information or people who can give it to you. You have a right to (and should) try to verify what one individual tells you about a whole group. You aren’t a bigot for asking for more information, but it is totally unwarranted for you to try to tell us what our concerns are, or pretend that you know more about our experiences and struggles than we do. It’s the difference between agnosticism and making a positive claim — it’s perfectly ethical to reserve judgment on an issue until you have more data, but if you want to assert that the expert consensus on this issue is in fact false, you’re going to need some pretty overwhelming evidence. If you want to tell a member of a marginalized group or the entire group as whole that they’re wrong about their own lives, don’t be surprised to experience some significant pushback. If the evidence is on your side, there’s no need to get defensive; simply present your case and most reasonable people will be convinced. Your defensiveness to criticism betrays not only the weakness of your position, but also your insecurity. 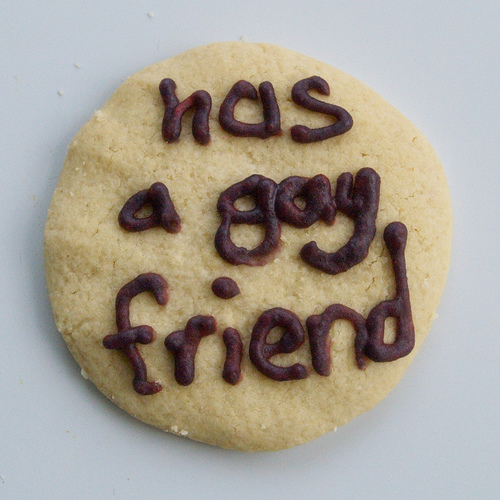 When I complain about straight people, men and cis people to my partners (who are both straight-identified cis men) they don’t get offended, because they know I’m not talking about them. They don’t have to tell me how accepting and progressive and egalitarian they are; they show me every day through their words and actions. When my friends of color complain about white people, I don’t take it personally as a white person. I try to listen to what they say so I can examine my own attitudes, see if any of them contribute to the struggles of my friends, and learn how to be a better ally to them. As a queer and trans person I know how cathartic it is to vent about people who don’t recognize their own contributions to oppression, so it makes me happy on their behalf to see them doing the same thing, even if I happen to belong to the group they’re venting about. It seems to me that the only reason to so vociferously defend your righteousness would be if you were concerned with others’ perceptions of you and your intentions. I know that I try my best to listen to the concerns of people of color, so it doesn’t offend me at all when they complain about bigoted white people, because I don’t consider myself bigoted. (At least overtly. As I said in my Facebook exchange above, I still have to wrestle with my cultural programming and unconscious biases.) The only reason to be personally offended when someone complains about racist white people would be if I considered myself a racist white person. If I listen to their complaint, honestly examine myself and find that I am not guilty of the accusation, I know they’re not talking about me so there’s no reason to be upset. I often wonder the same thing about cisgender people who object to being called “cis” because they see trans people venting about the harmful things cis people have done to them. If you are not one of those people who have hurt us, why be upset? Before you tell yourself, “I’ve never done any of those things, so I’m a good ally,” and click away from this blog feeling sanctimonious and derisive about those bad allies, take an honest look at yourself. I’d be surprised if you have never or will never act or speak in a similar way at some point. I know that I have. I didn’t always used to be so open to criticisms of white people, for example. It used to be that when I’d see a person of color complaining about white people I’d feel a little personally hurt, even if I didn’t say anything to them about it. I’d think, “I’m white and I don’t believe that other races are inferior in any way. I’m for racial equality all the way. It’s so unfair for them to make assumptions about me and my intentions when they don’t even know me.” It took me several years to accept that even though my intentions toward people of color were and are good, I still hold the unconscious biases that have been programmed into me from my culture. I always meant well, but it didn’t make me perfect or incapable of saying, doing or thinking something bigoted without meaning to. Your good intentions are necessary for allyship, but they are not sufficient. Your words and actions matter just as much. The next time you feel defensive and are tempted to discredit a marginalized person’s experience or prove how tolerant you are, ask yourself: “Is my goal in this moment to listen, learn and support this person or this group, or is it to protect my reputation or ego?” If it’s the later, try to take a step back and work towards the former. Trans people can’t read your mind and know what your intentions are. We don’t know what your past actions are. We don’t know if you have a trans family member who you love and support, or if you’ve donated money to LGBT organizations, or if you’ve canvassed for pro-equality legal policies. All we know is how you speak and act in the present. If you do that with love, respect, openness and compassion, you won’t have to worry about being perceived as bigoted, because those you interact with will know what kind of person you are.